A beautiful and fragrant gardenia with white gardenia buds ready to flower. This plant arrives ready to bloom shortly after arrival. This is a wonderful memorial gift that will fill any room with a sweet floral aroma. A beautiful and fragrant gardenia with white gardenia buds ready to flower. This plant arrives ready to bloom shortly after arrival. This is a wonderful memorial gift that will fill any room with a sweet floral aroma. We are unable to ship trees to Alaska. Each gardenia gift tree comes with growing instructions, a small watering tool. Wrapped as shown in a beautiful jute bag with ribbon and delivers in an elegant print gift box. Gardenias are only well suited for the 8-10 tree zone area which is the southern warm climates. Please note the tree does not arrive with the buds as shown but they will bloom shortly after arrival. 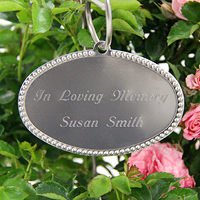 A personalized engraving tag is available as an additional option for an additional cost of $ 19.95. YOU MUST CHECK THE BOX FOR PERSONALIZATION IN ORDER FOR IT TO BE IN INCLUDED IN YOUR FINAL PURCHASE. *PLEASE DO NOT INCLUDE PERSONALIZATION IN THE ORDERING PROCESS IF YOU DO NOT WANT THE PERSONALIZED TAG. Each item, the tree and the tag would need to be added to the cart separately. Two lines personalized 20 characters each including spacing. These 100% stainless steel gift tree tags add that special touch and are tough enough to be used outdoors. The Engraved Tag is only available with a tree purchase and IS NOT AVAILABLE as a single purchase.